You can call it grass, weed, pot, tea, ganja, or marijuana. you can eat, wear, grow, or smoke it. But one thing is for sure: You can't ignore it! Through much of history, a dense cloud of passionate belifs and controversy has swirled around the subject of cannabis. A tall hardy weed, cannabis is the only plant on the planet that yields both a drug and a highly used commercial fiber. French poets ate it and established clubs in its honor. Jazz musicians smoked it and "saw God.' Japanese artisans wove it into religious garments, and today lobbyists fight to use it medicinally. It's been a long, strange trip for cannabis, and along the way the wily weed has been deified and demonized to the point that it's hard to know where the truth ends and the marijuana myth begins. 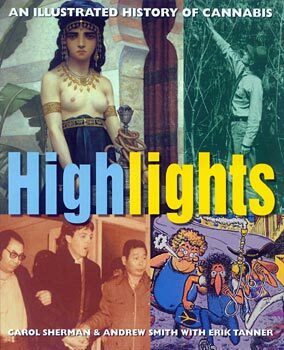 It's high time for Highlights, a book that looks at the cannabis carousel, and tries to figure out where we are and how we got here. From the grass roots beginnings to reefer madness in high society, Highlights traces the colorful 10,000-year journey of this illustrious weed.